Welcome to the Healthcare Launchpad! 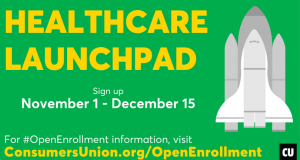 Open Enrollment, which runs from November 1 – December 15, is the only time most people can sign up for a 2018 health insurance plan under the Affordable Care Act (ACA). You can also find out whether you qualify for financial assistance to help pay for your healthcare coverage during Open Enrollment. Below, we’ve explained the steps you’ll need to take to enroll. And because some states extend their Open Enrollment beyond December 15, we’ve listed the key dates for each state—as well as information on how to find local help with the enrollment process. ¿Necesitas ayuda? Haz clic aquí para información en español. Explore your state’s healthcare exchange. You can learn about your available coverage options, what financial assistance you qualify for, and get an estimate of your healthcare costs from your state’s exchange website. You will have to enter some basic info about yourself and your family to view the plans available in your area. You’ll also find out if you’re likely to qualify for financial assistance or Medicaid. Pick a plan. Once you’ve entered your information, you will be able to compare costs, including premiums, copays, deductibles, and other out-of-pocket expenses, for each level of coverage (Bronze, Silver, Gold, or Platinum). You should also check if your preferred doctors and hospitals are in the plan network. Keep in mind that you’ll generally pay higher premiums for Platinum and Gold plans, but less each time you see a doctor or fill a prescription. And the reverse is generally true with Silver and Bronze level plans: Lower premiums, but higher out-of-pocket expenses. Apply. Once you’ve decided on a plan, you can apply online or by phone. You also can get free, confidential help on the enrollment and application process; follow the links below to set up a local appointment with an Assister in your state. Pay your bill. You’re not done yet. You need to pay the first month’s premium in order for your coverage to take effect. Some plans accept the first payment through the online application system; others will send a bill by mail.